GALESBURG, ILL, USA — I came to the U.S. in my early 20s for college from my village in Middle Belt, Nigeria. Prior to that, I was an international student in neighboring West African countries Liberia and Sierra Leone. One of the many things I appreciate about my upbringing is my parents’ willingness to let their children explore life. The two things expected of us were to succeed in whatever we did and contribute in building our community. When my partner and I told folks that we were moving to Mississippi, many of them asked, “Of all places, why Mississippi?” They expressed concern for our safety, citing lynching stories and depressing poverty statistics. As a granddaughter of a diviner, I wondered whether the concerns were premonitions. Nonetheless, we went ahead with our plan. Most of my education has been at private white institutions. I saw going to Mississippi and working at an HBCU as an opportunity to give back to the African American community because their struggle for human and civil rights cleared the path for many immigrants in the U.S. Upon arrival at the Jackson bus station, I was surrounded by many shades of beautiful chocolate faces. I felt a sense of akwaaba (welcome), as though I had arrived in Accra, Ghana. But as the proverbial wisdom of my ancestors, the Yotti/Bali (Chamba) teaches us, “A rolling stone gathers no moss” (time brings clarity). Over a period of several months, this positive feeling became tempered with a sense of disappointment. 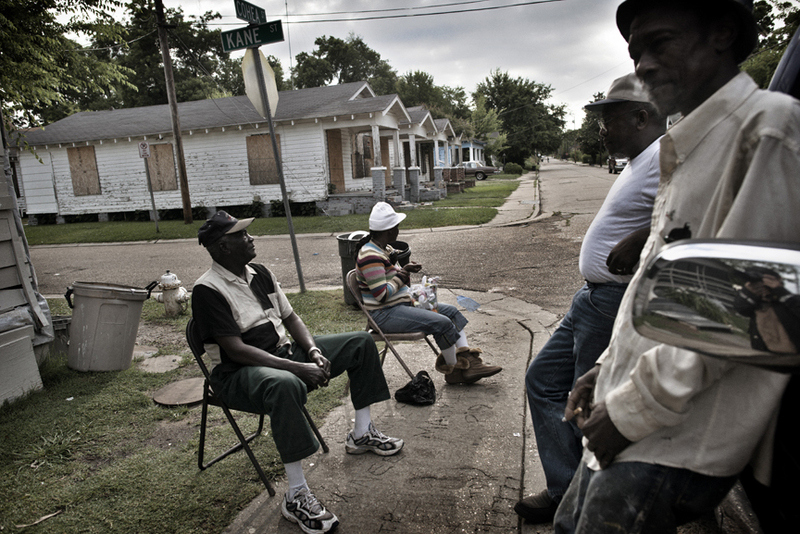 Life is tough in Mississippi, and poverty is extreme. The flight of (white) wealth from the capital city is evident. Employment opportunities and investments in Jackson are severely limited. Downtown Jackson only has a few businesses but, like many black communities, it has an over-abundance of churches. My neighborhood in west Jackson was a food desert. To buy fresh vegetables, we had to travel to white neighboring cities or wait to visit the farmers market on weekends. These realities explain why many African Americans, especially those in the South, struggle with obesity and related health issues. Many Jackson residents buy bottled water because the city pipes have not been properly maintained for decades. It is not uncommon to walk through west Jackson and see water flowing out of pipes for weeks. Our community was overwhelmed with dilapidated homes. Roads are overrun with potholes and uncleaned gutters. Despite the challenges of poverty and bad infrastructure, Jacksonians retain a remarkable vibrancy. As a Nigerian woman, I was especially impressed with the black community’s efforts to honor their African heritage. Mississippi sometimes reminds me of home. A women’s group based in Jackson organizes an annual Kwanzaa event to celebrate their cultural roots. Some Mississippians still grow their food, just as we do in my village. I once took an hour-long ride to my neighbor’s 90 acres of land, where his parents farmed several crops. On public buses, strangers greet you as though you knew each other. In the summer evenings, neighbors sit shirtless on their verandas and chat until mosquitoes start to bite, just like in my village. People are willing to go an extra mile to help each other. When we were looking for a house to rent, my partner’s colleague took a few days after work to help. In my African Traditional Religions course at Jackson State University, students were eager to share stories about relatives who practice Vodou (Voodoo) or “roots,” even though they identify as Christians. On the other hand, some Mississippians have internalized anti-African sentiments. I was reported by a student and subsequently scolded by my supervisor for introducing myself as an Africanist (i.e. pro-Africa). Notwithstanding my complicated experiences in Mississippi, I saw hopeful signs of potential for progress. Organizations like Cooperation Jackson and the Malcolm X Grassroots Organization are advocating for policies that would benefit under-served communities. The Perkins Foundation trains young leaders in Jackson. To address the lack of summer art education for children in rural Gloster, Miss., Ms. Margaret and Quincy Troupe use their celebrity connections with Terry McMillan, Rachel Griffiths, Danny Glover and others to fill this gap. We attended Ms. Troupe’s annual event and were inspired. And Anderson United Methodist, the home church of the late Mayor Chokwe Lumumba, encourages revolutionary thinking, provides a platform for local artists and contributes scholarships for African students to study at Africa University in Zimbabwe. As we empathize with the poor overseas, let us not forget places like Mississippi, where Blacks are struggling against daunting barriers here in the U.S. This story clearly pokes at the intransigent idea of the impressionable. America is not, has never been, and probably never will be the Shining City upon that Hill. Yoknyam Dabale brings us her personal touch to understanding the irony in “God’s Country” that escapes the hearts and minds of the often naive. The American Dream is as radicalized and racialized as American Slavery itself – few comprehend its far digging fangs. “The Shining City upon a Hill,” indeed. They mean the Shiny City of Barbarity! Wealth extraction from black communities in the South of the US especially is crazy! They folks in Jackson pay taxes alright, just like the folks in Lemmon, South Dakota. But in SD there are only 12 percent of the people below poverty and in Jackson, there are 33 percent! The difference? One city is white and the other Black. Like some other budding flowers of Pan-Afrikanism at home and abroad, Sister Yoknyam Dabale depicts the hopeful fact that new Beautyful Ones are stll being born! The article and comments on it so far remind me of John Pepper Clarke’s “America, Their America”! May we have more Truthtalk about the Amerikkkan Nightmare that exposes the hollowness of the Amerikkkan Dream which, not only most African-Amerikkkans but also many Africans from the continent, particularly the Yankee beentos, still peddle Big Lies about! For the effective counteraction of Yankee Miseducation and the truthful conscientization of the masses of our Afrikan people at home and abroad, we must take Pan-Afrikanism practically more seriously beyond the verbal and written rhetorics, as Sister Yoknyam and her partner are impressively doing. Now more than ever before we need to do not only Sankofa but also Harambee in order to pool together, through intensive and expansive glocal link-networking, all our spiritual, human and material resources for the practical advancement of true Pan-Afrikanism to its inevitable global Victory! Thanks for sharing, Yoknyam. I have traveled through Mississippi and didn’t know the conditions were so poor–with unclean water and little fresh food–for blacks in Jackson. You and your partner have a lot of travels in Miss. and Illinois and how your previously went to school in Sierra Leone and Liberia form Nigeria. And there is a lot of insight to be gained from your observations. I look forward to reading more about your thoughts on African traditional religions and your experiences! Thanks for pointing this out. Too many Africans look down upon African Americans and fail to realize that the reason why they have any opportunities in the US–from education to jobs to the ability to own a house and cultivate a livelihood–is because of the African Americans who marched, fought, and died for their rights as citizens. Even today as this article shows, the system is stacked against them with poverty and wealth extraction. It is great that the author really gets to know her surroundings and contributes to her community. Thank you Yoknyam for opening our eyes! especially with your phrase “give back to the African American community”. I couldn’t agree more with Abena Maanu! I hope more and more Africans living in America will be touched by writings like this and actually do something about it. As Africans we are used to be on the receiving end and forget that we also have to give. Sometimes [when I used to be in the USA] I felt that Africans and African-Americans do not really understand each other. May be both sides need to do some deliberate efforts to get to know each other and see where you can help. Giving can help the giver to become more aware of his/her position in this world and live a more dignified life. Your story reminds me of my first week in the USA when I got stung 8 times by yellow jackets while cleaning dirt in the rehabilitation house where most of the housed were African Americans. I also remember separating two young African American boys who were about to start. Someone [a white person] said to me ” You know these people sometimes they have no inspiration for good behaviour…so they probably need someone like you”. I was too naive to understand problems facing African American communities and how I could be of any help [being an African student on financial aid] but your articles challenges all of us to see ways we could be on the giving end!